, bishop of Rochester in the reigns of queen Anne and king George I. was born March 6, 1662-3, at Milton or Middleton Keynes, near Newport- Pagnel, Bucks. He was admitted a king’s scholar in 1676 at Westminster-school; and thence, in 1680, was elected a student of Christ-Church college, Oxford, where he soon distinguished himself by his wit and learning and gave early proofs of his poetical talents, in a Latin version of Dryden’s “Absalom and Achitophel,” published in 1682; and in 1684 he edited the “Ανθολογια, seu selecta quædam poematum Italorum qui Latin escripserunt,” which was afterwards enlarged and published by Pope in 1740, with the omission, however, of Atterbury’s excellent preface. In 1687 he made his first essay in controversial writing, and shewed himself as an able and strenuous advocate for the Protestant religion, in “An Answer to some Considerations on the spirit of Martin Luther, and the original of the Reformation.” These Considerations were published under the name of Abraham Woodhead, who was a popish writer, but were really written by Obadiah Walker, master of University college, Oxford. 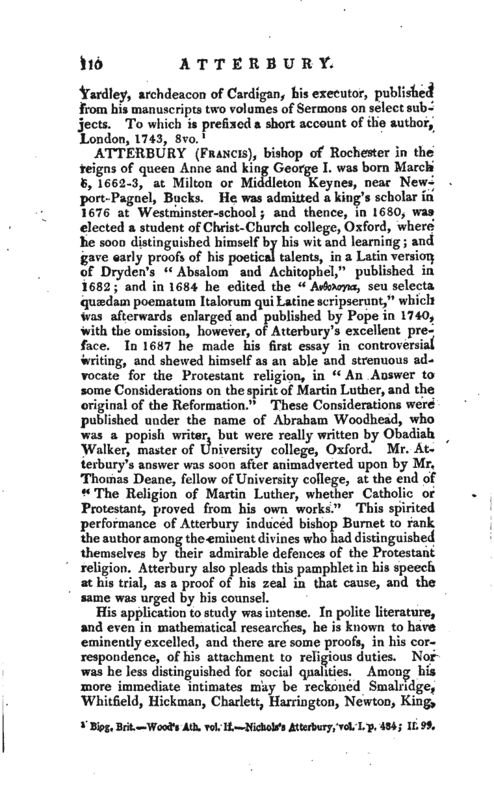 Mr. Atterbury’s answer was soon after animadverted upon by Mr. Thomas Deane, fellow of University college, at the end of “The Religion of Martin Luther, whether Catholic or Protestant, proved from his own works.” This spirited performance of Atterbury induced bishop Burnet to rank the author among the eminent divines who had distinguished themselves by their admirable defences of the Protestant religion. Atterbury also pleads this pamphlet in his speech at his trial, as a proof of his zeal in that cause> and the same was urged by his counsel. 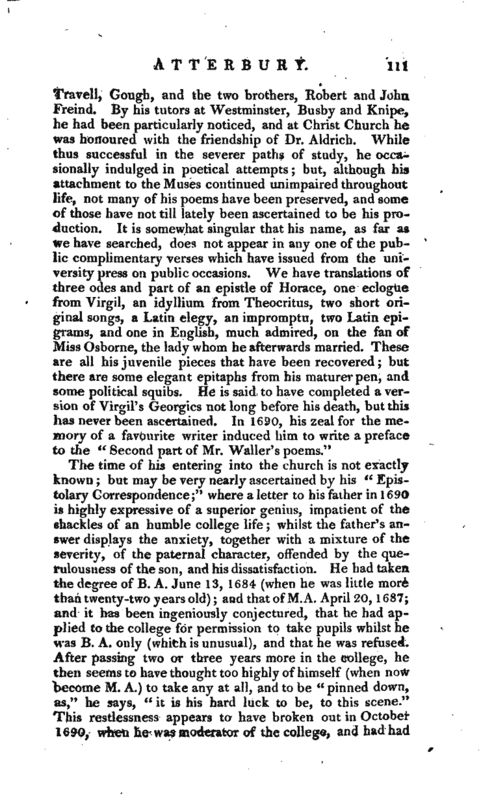 The time of his entering into the church is not exactly known but may be very nearly ascertained by his “Epistolary Correspondence;” where a letter to his father in 1690 is highly expressive of a superior genius, impatient of the shackles of an humble college life whilst the father’s answer displays the anxiety, together with a mixture of the severity, of the paternal character, offended by the quemlousness of the son, and his dissatisfaction. He had taken the degree of B. A. June 13, 1684 (when he was little more than twenty-two years old) ayd that of M.A. April 20, 1687; and it has been ingeniously conjectured, that he had applied to the college for permission to take pupils whilst he xv.is B. A. only (winch is unusual), and that he was refused. After passing two or three years more in the college, he then seems to have thought too highly of himself (when now become M. A.) to take any at all, and to be “pinned down, as,” he says, “it is his hard luck to be, to this scene.” This restlessness appears to have broken out in October 1690, when he was moderator of the college, and had had | Mr. Boyle four months under his tuition, who a took up half his time,“and whom he never had a thought of parting with till he should leave Oxford; but wished he” could part with him to-morrow on that score.“The father tells him in November,” You used to say, when you had your degrees, you should be able to swim without bladders. 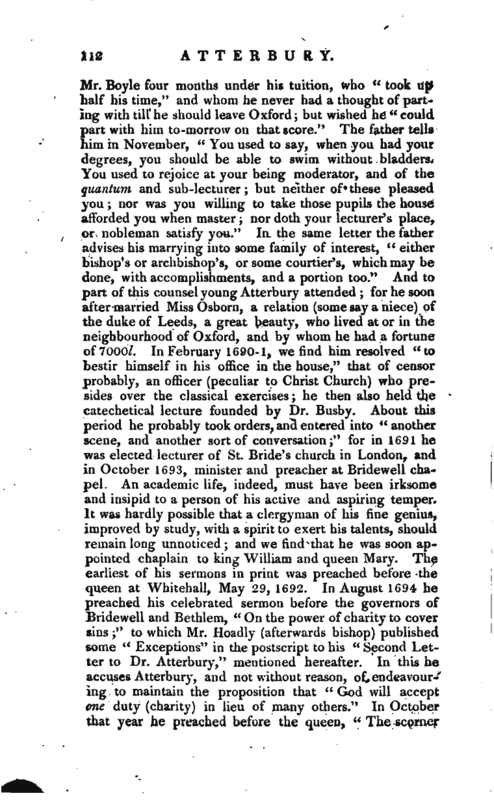 You used to rejoice at your being moderator, and of the quantum and sub-lecturer but neither of these pleased you; nor was you willing to take those pupils the house afforded you when master nor doth your lecturer’s place, or nobleman satisfy you.“In the same letter the father advises his marrying into some family of interest,” either bishop’s or archbishop’s, or some courtier’s, which may be done, with accomplishments, and a portion too.“And to part of this counsel young Atterbury attended for he soon after married Miss Osborn, a relation (some say a niece) of the duke of Leeds, a great beauty, who lived at or in the neighbourhood of Oxford, and by whom he had a fortune ofTOOO/. In February 1690-1, we find him resolved” to bestir himself in his office in the house,“that of censor probably, an officer (peculiar to Christ Church) who presides over the classical exercises he then also held the catechetical lecture founded by Dr. Busby. About this period he probably took orders, and entered into” another scene, and another sort of conversation;“for in 1691 he was elected lecturer of St. Bride’s church in London, and in October 1693, minister and preacher at Bridewell chapel. An academic life, indeed, must have been irksome and insipid to a person of his active and aspiring temper. It was hardly possible that a clergyman of his fine genius, improved by study, with a spirit to exert his talents, should remain long unnoticed and we find that he was soon appointed chaplain to king William and queen Mary. The earliest of his sermons in print was preached before the queen at Whitehall, May 29, 1692. In August 1694 he preached his celebrated sermon before the governors of Bridewell and Bethlem,” On the power of charity to cover sins“to which Mr. Hoadly (afterwards bishop) published sorne^” Exceptions“in the postscript to his” Second Letter to Dr. Atterbury,“mentioned hereafter. 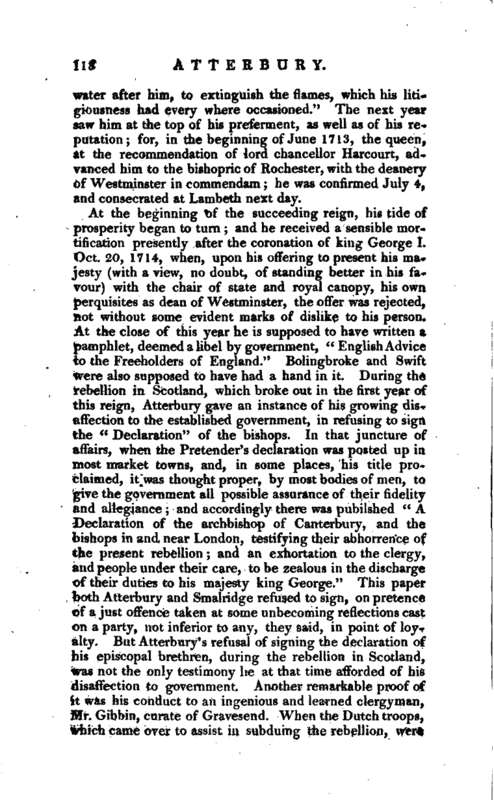 In this he accuses Atterbury, and not without reason, of endeavouring to maintain the proposition that” God will accept one duty (charity) in lieu of many others.“In” October that year he preached before the queen p “The scorncr | incapable of true wisdom” which was also warmly attacked by a friend of sir Robert Howard, author of “The History of Religion,” supposed to be alluded to in this sermon. The pamphlet was entitled “A two-fold Vindication of the late archbishop of Canterbury, and the Author of the History of Religion, &c.” 1696, 8vo. The share he took in the controversy against Bentley is now very clearly ascertained. In one of the letters to his noble pupil, dated “Chelsea, 1698,” he says, “the matter had cost him some time and trouble. In laying the design of the book, in writing above half of it, in reviewing a good part of the rest, in transcribing the whole, and attending the press,” he adds, “half a year of my life went away.” His pupil, afterwards lord Orrery, about the year 1695, obliged the world with a new edition of Phalaris’s Epistles in the preface to which, he complains of Dr. Bentley, the king’s library-keeper, who had (pro solitd sud humanitate) denied him the inspection of a valuable manuscript. 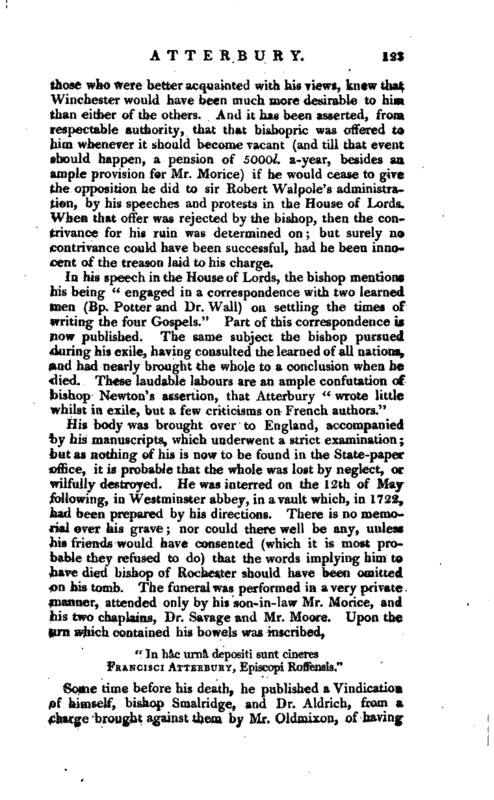 This sarcasm so exasperated the doctor, that, in order to his revenge on Mr. Boyle, he published a long letter to Dr. Wotton, who was then employed in writing on the State of ancient and modern Learning in which he undertakes to prove, that the Epistles, which go under the name of Phalaris, are spurious, and probably the work of some modern sophist. This drew from Mr. Boyle a reply, so full of satire and raillery, that, on which side soever truth and argument may be supposed to lie, the wit, and the laugh too, were evidently on Mr. Boyle’s. This reply was said to be written, jointly, by a select club of ingenious men belonging to Christ Church among whom. Atterbury is now clearly proved to have been the chief. In 1700, a still larger field of activity opened, in which Atterbury was engaged four years with Dr. Wake (afterwards archbishop of Canterbury) and others, concerning the rights, powers, and privileges of convocations in which he displayed so much learning and ingenuity, as well as zeal for the interests of his order, that the lower house of convocation returned him their thanks; and in consequence of this vote a letter was sent to the university of Oxford, expressing, that, “whereas Mr. Francis Atterbury, late of Christ Church, had so happily asserted the rights and privileges of an English convocation, as to merit the solemn thanks of the lower house for his learned pains upon that subject; it might be hoped, that the university would be | no less forward in taking some public notice of so great a piece of service to the church and that the most proper and seasonable mark of respect to him, would be to confer on him the degree of doctor in divinity by diploma, without doing exercise, or paying fees.” The university approved the contents of this letter, and accordingly created Mr. AtterburyD.D. Out author’s work was entitled, “The Rights, Powers, and Privileges of an English Convocation stated and vindicated, in answer to a late book of Dr. Wake’s, entitled ‘ The Authority of Christian Princes over their Ecclesiastical Synods asserted,’ &c. and several other pieces,” 8vo. The fame of this work was very great; but it was censured by Burnet, and in November the judges had a serious consultation on it, as being supposed to affect the royal prerogative. Holt, then chief justice, was strongly of that opinion, and the same idea was encouraged by archbishop Tenison, Dr. Wake, and others. Endeavours were made to prejudice king William against him, but his majesty remained indifferent; and on the other hand, Atterbury gained the steady patronage of sir Jonathan Trelawny, bishop of Exeter, of Lawrence earl of Rochester, and of bishop Sprat. In December 1700, he published a second edition of “The Rights,” considerably enlarged, and with his name, and a dedication to the two archbishops. This was immediately answered by Drs. Kennet, Hody, and Wake. Another controversy of some importance was at this time also ably agitated by Atterbury, the execution of the prtemunienles, a privilege enjoyed by the several bishops of issuing writs to summon the inferior clergy to convocation. Bishops Compton, Sprat, and Trelawny, were his strenuous supporters on this occasion, and by the latter he was presented to the archdeaconry of Totness, in which he was installed Jan. 29, 1700-1. His attendance in convocation was regular, and his exertions great. 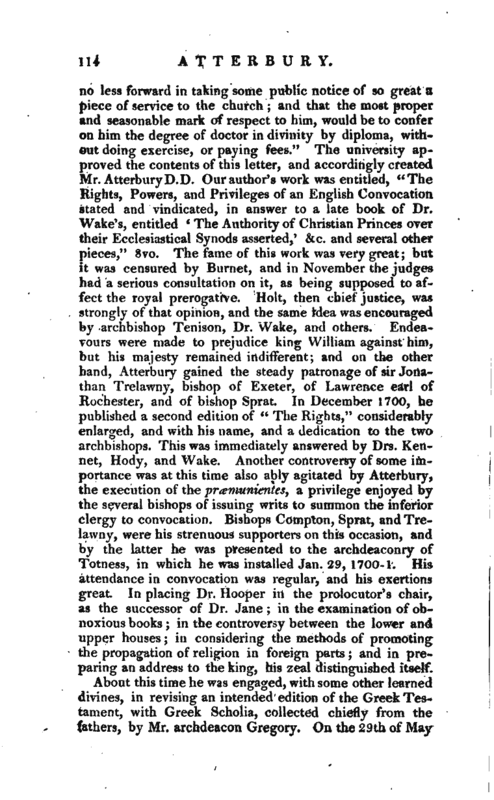 In placing Dr. Hooper in the prolocutor’s chair, as the successor of Dr. Jane in the examination of obnoxious books in the controversy between the lower and upper houses in considering the methods of promoting the propagation of religion in foreign parts and in preparing an address to the king, his zeal distinguished itself. About this time he was engaged, with some other learned divines, in revising an intended edition of the Greek Testament, with Greek Scholia, collected chiefly from the fathers, by Mr. archdeacon Gregory. On the 29th of May | he preached before the House of Commons; and on Aug. 16, published “The power of the Lower House of Convocation to adjourn itself,” which was a sort of analysis of the whole controversy. He also published “A letter to a clergyman in the country, concerning the Choice of Members, &c.” Nov. 17, 1701; a second, with a similar title, Dec. 10, 1701; and a third, in defence of the two former, Jan. 8, 1701-2. In October he published “The parliamentary origin and rights of the Lower House of Convocation, cleared, &c.” At this period he was popular as preacher at the Rolls Chapel, an office which had been conferred on him by sir John Trevor, a great discerner of abilities, in 1698, when he resigned JBridewell, which he had obtained in 1693. Upon the accession of queen Anne, in 1702, Dr. Atterbury was appointed one of her majesty’s chaplains in ordinary and, in July 1704, was advanced to the deanery of Carlisle but, owing to the obstacles thrown in his way by bishop Nicolson, he was not instituted tintil Oct. 12, and the same year Sir Jonathan Trelawny bestowed on him a canonry of Exeter. About two years after this, he was engaged in a dispute with Mr. Hoadly, concerning the advantages of virtue with regard to the present life, occasioned by his sermon, preached August 30, 1706, at the funeral of Mr. Thomas Bennet, a bookseller. The doctrine of this sermon Mr. Hoadly examined, in “A letter to Dr. Francis Atterbury, concerning Virtue and Vice,” published in 1706.; in which he undertakes to shew, that Dr. Atterbury has extremely mistaken the sense of his text. 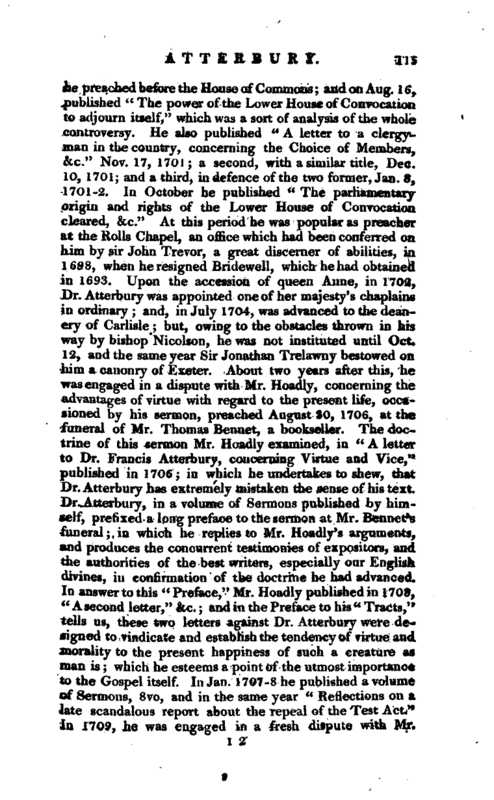 Dr. Atterbury, in a volume of Sermons published by himself, prefixed a long preface to the sermon at Mr. Bennet’s funeral in which he replies to Mr. Hoadly’s arguments, and produces the concurrent testimonies of expositors, and the authorities of the best writers, especially our English divines, in confirmation of the doctrine he had advanced. 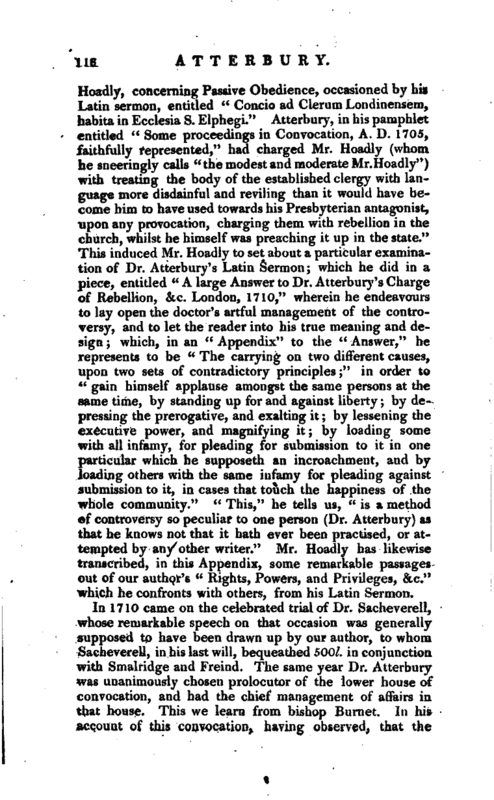 In answer to this “Preface,” Mr. Hoadly published in 170&, “Asecond letter,” &c. and in the Preface to his “Tracts,” tells us, these two letters against Dr. Atterbury were designed to vindicate and establish the tendency of virtue and morality to the present happiness of such a creature as man is which he esteems a point of the utmost importance to the Gospel itself. In Jan. 1707-8 he published a volume of Sermons, 8vo, and in the same year “Reflections on a late scandalous report about the repeal of the Test Act.” In 1709, he was engaged in a fresh dispute with Mr, | Hoadly, concerning Passive Obedience, occasioned by his Latin sermon, entitled “Concio ad Clerum Londinensem, habita in Ecclesia S. Elphegi.” Atterbury, in his pamphlet entitled “Some proceedings in Convocation, A. D. 1705, faithfully represented,” had charged Mr. Hoadly (whom he sneeringly calls “the modest and moderate Mr. Hoadly”) with treating the body of the established clergy with language more disdainful and reviling than it would have become him to have used towards his Presbyterian antagonist, upon any provocation, charging them with rebellion in the church, whilst he himself was preaching it up in the state.“This induced Mr. Hoadly to set about a particular examination of Dr. Atterbury‘ s Latin Sermon; which he did in a piece, entitled” A large Answer to Dr. Atterbury’s Charge of Rebellion, &c. London a 1710,“wherein he endeavours to lay open the doctor’s artful management of the controversy, and to let the reader into his true meaning and design which, in an” Appendix“to the” Answer,“he represents to be” The carrying on two different causes, upon two sets of contradictory principles“in order to” gain himself applause amongst the same persons at the same time, by standing up for and against liberty; by depressing the prerogative, and exalting it by lessening the executive power, and magnifying it by loading some with all infamy, for pleading for submission to it in one particular which he supposeth an mcroachment, and by loading others with the same infamy for pleading against submission to it, in cases that touch the happiness of the whole community.“” This,“he tells us,” is a method of controversy so peculiar to one person (Dr. Atterbury) as that he knows not that it hath ever been practised, or attempted by any other writer.“Mr. Hoadly has likewise transcribed, in this Appendix, some remarkable passages out of our author’s” Rights, Powers, and Privileges, &c." which he confronts with others, from his Latin Sermon. In 1710 came on the celebrated trial of Dr. Sacheverell, whose remarkable speech on that occasion was generally supposed to have been drawn up by our author, to whom Sacheverell, in his last will, bequeathed 500l. in conjunction with Smalridge and Freind. The same year Dr. Atterbury was unanimously chosen prolocutor of the lower house of convocation, and had the chief management of affairs in that house. This we learn from bishop Burnet.In his account of this convocation, having observed, that the | queen, in appointing a committee of bishops to be present, and consenting to their resolutions, not only passed over all the bishops made in king William’s reign, but a great many of those named by herself, and set the bishops of Bristol and St. David’s, then newly consecrated, in a distinction above all their brethren, by adding them to the committee, upon the indisposition of the archbishop and others, he adds “All this was directed by Dr. Atterbury, who had the confidence of the chief minister and because the other bishops had maintained a good correspondence with the former ministry, it was thought fit to put the marks of the queen’s distrust upon them, that it might appear with whom her royal favour and trust wa^ lodged.” May 11, 1711, he was appointed, by the convocation, one of the committee for comparing Mr. Whiston’s doctrines with those of the church of England and, in June following, he had the chief hand in drawing up “A Representation of the present State of Religion.” In 1712, Dr. Atterbury was made dean of Christ Church, notwithstanding the strong interest and warm applications of several great men in behalf of his competitor Dr. Smalridge but, “no sooner was he settled there,” says Stackhouse, “than all ran into disorder and confusion. The canons had been long accustomed to the mild and gentle government of a dean, who had every thing in him that was endearing to mankind, and could not therefore brook the wide difference that they perceived in Dr. Atterbury. That imperious and despotic manner, in which he seemed resolved to carry every thing, made them more tenacious of their rights, and inclinable to make fewer concessions, the more he endeavoured to grasp at power, and tyrannize. This opposition raised the ferment, and, in a short time, there ensued such strife and contention, such bitter words and scandalous quarrels among them, that it was thought adviseable to remove him, on purpose to restore peace and tranquillity to that learned body, and that tether colleges might not take the infection a new method of obtaining preferment, by indulging such a temper, and pursuing such practices, as least of all deserve it In a word,” adds this writer, “wherever he came, under one pretence or other, but chiefly under the notion of asserting his rights and privileges, he had a rare talent of fomenting discord, and blowing the coals of contention which made a learned successor (Dr. Smalridge) in two of his preferments complain of his hard fate, in being forced to carry | water after him, to extinguish the flames, which his litigiousness had every where occasioned.” The next year saw him at the top of his preferment, as well as of his reputation for, in the beginning of June 1713, the queen, at the recommendation of lord chancellor Harcourt, advanced him to the bishopric of Rochester, with the deanery of Westminster in commendam he was confirmed July 4, and consecrated at Lambeth next day. At the beginning of the succeeding reign, his tide of prosperity began to turn and he received a sensible mortification presently after the coronation of king George I. Oct. 20, 1714, when, upon his offering to present his majesty (with a view, no doubt, of standing better in his favour) with the chair of state and royal canopy, his own perquisites as dean of Westminster, the offer was rejected, not without some evident marks of dislike to his person. At the close of this year he is supposed to have written a pamphlet, deemed a libel by government, “English Advice to the Freeholders of England.” Bolingbroke and Swift were also supposed to have had a hand in it. During the rebellion in Scotland, which broke out in the first year of this reign, Atterbury gave an instance of his growing disaffection to the established government, in refusing to sign the “Declaration” of the bishops. In that juncture of affairs, when the Pretender’s declaration was posted up in most market towns, and, in some places, his title proclaimed, it^was thought proper, by most bodies of men, to give the government all possible assurance of their fidelity iand allegiance and accordingly there was published “A Declaration of the archbishop of Canterbury, and the bishops in and near London, testifying their abhorrence of the present rebellion and an exhortation to the clergy, and people under their care, to be zealous in the discharge of their duties to his majesty king George.” This paper both Atterbury and Smalridge refused to sign, on pretence of a just offence taken at some unbecoming reflections cast on a party, not inferior to any, they said, in point of loyalty. But Atterbury’ s refusal of signing the declaration of his episcopal brethren, during the rebellion in Scotland, was not the only testimony he at that time afforded of his disaffection to government. 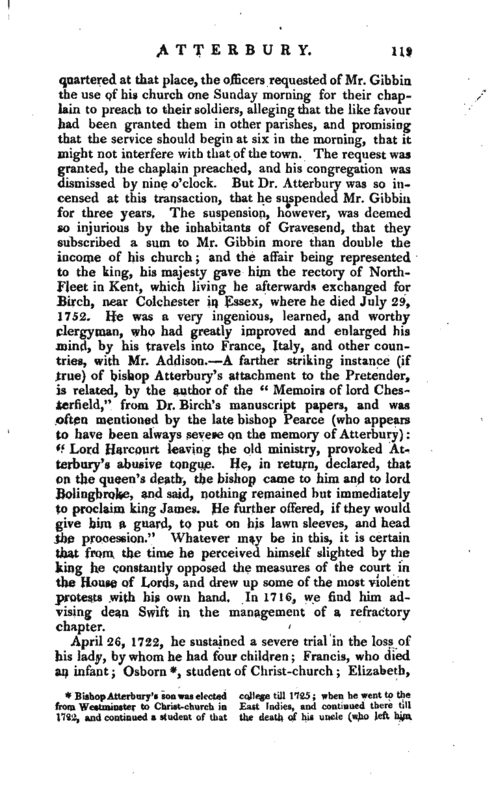 Another remarkable proof of it was his conduct to an ingenious and learned clergyman, Mr. Gibbin, curate of Gravesend. When the Dutch troops, which came over to assist in subduing the rebellion, were | quartered at that place, the officers requested of Mr. Gibbin the use of his church one Sunday morning for their chaplain to preach to their soldiers, alleging that the like favour had been granted them in other parishes, and promising that the service should begin at six in the morning, that it might not interfere with that of the town. The request was granted, the chaplain preached, and his congregation was dismissed by nine o’clock. But Dr. Atterbury was so in^ censed at this transaction, that he suspended Mr. Gibbiu for three years. The suspension, however, was deemed so injurious by the inhabitants of Gravesend, that they subscribed a sum to Mr. Gibbin more than double the income of his church and the affair being represented to the king, his majesty* gave him the rectory of NorthFleet in Kent, which living he afterwards exchanged for Birch, near Colchester in Essex, where he died July 29, 1752. He was a very ingenious, learned, and worthy clergyman, who had greatly improved and enlarged his mind, by his travels into France, Italy, and other countries, with Mr. Addison. 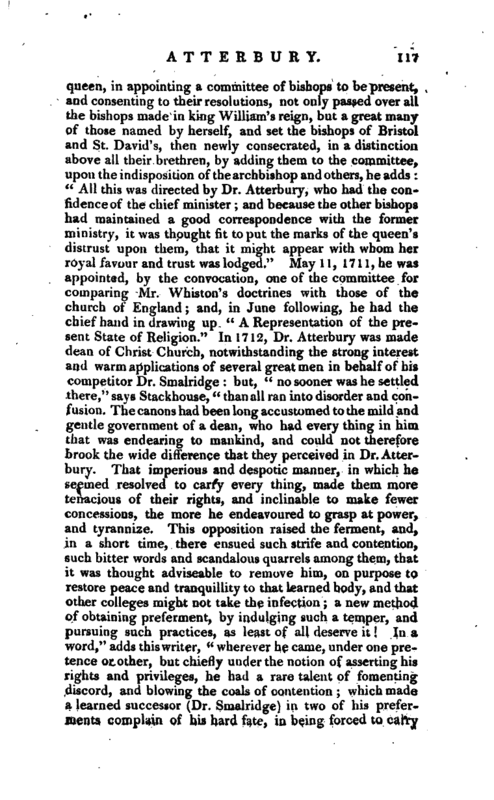 A farther striking instance (if true) of bishop Atterbury’s attachment to the Pretender, is related, by the author of the “Memoirs of lord Chesterfield,” from Dr. Birch’s manuscript papers, and was often mentioned by the late bishop Pearce (who appears to have been always severe on the memory of Atterbury) “Lord Harcourt leaving the old ministry, provoked Atterbury’s abusive tongue. He, in return, declared, that on the queen’s death, the bishop came to him and to lord Bolingbroke, and said, nothing remained but immediately to proclaim king James. He further offered, if they would give him a guard, to put on his lawn sleeves, and head the procession.” Whatever may be in this, it is certain that from the time he perceived himself slighted by tile king he constantly opposed the measures of the court in the House of Lords, and drew up some of the most violent protests with his own hand. In 1716, we find him advising dean Swift in the management of a refractory chapter. the reversion of his fortune), and of his father, who took no notice of him in his will, which bears date Dec. 31, 1725. In 1744 he was ordained by his father’s great rival, bishop Hoadly; and in June 1746, obtained the rectory of Oxhill, Warwickshire. He left a widow and five children behind him, two sons and three daughters Francis, the eldest son was educated on the founda tion of Westminster, elected student of Christ-church, Oxford, in 1755; in 1768 was appointed, by the bishop of Clovne, his domestic chaplain; in 1770 was collated by him to the dignity of precentor in the cathedral of Cloyne; and in 1776 was presented to the valuable living of Clonmel, or the Great Islands, in the same diocese. student of Christ-church; Elizabeth, | who died Sept. 29, 1716, aged seventeen; and Mary, who had been then seven years married to Mr. Morice. In this memorable year, the government, on a suspicion of his being concerned in a plot in favour of the Pretender, had him apprehended August 24, and committed prisoner to the Tower. Two officers, the under-secretary, and a messenger, went about two o’clock in the afternoon to the bishop’s house at Westminster, with orders to bring him and his papers before the council. He happened to be in his night-gown when they came in, and being made acquainted with their business, he desired time to dress himself. In the mean time his secretary came in, and the officers went to search for his papers in the sealing of which the messenger brought a paper, which he pretended to have found in his close-siool, and desired it might be sealed up with the rest. His lordship observing it, and believing it to be a forged one, desired the officers not to do it, and to bear witness that the paper was not found with him. Nevertheless they did it and, though they behaved themselves with some respect to him, they suffered the. messengers to treat him in a very rough manner, threatening him, if he did not make haste to dress himself, they would carry him away undrest as he was. Upon which he ordered his secretary to see his papers all sealed up, and went himself directly to the Cockpit, where the council waited for him. 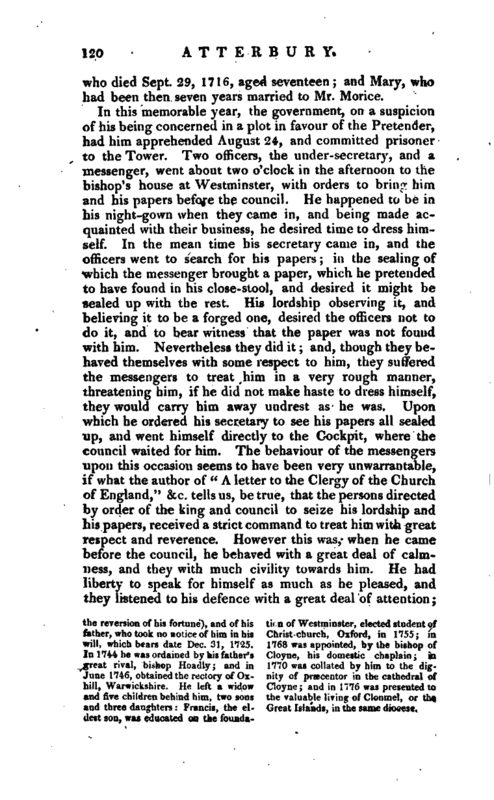 The behaviour of the messengers upon this occasion seems to have been very unwarrantable, if what the author of “A letter to the Clergy of the Church of England,” &c. tells us, be true, that the persons directed by order of the king and council to seize his lordship and his papers, received a strict command to treat him with great respect and reverence. However this was, when he came before the council, he behaved with a great deal of calmness, and they with much civility towards him. He had liberty to speak for himself as much as he pleased, and they listened to his defence with a great deal of attention; | and, what is more unusual, after he was withdrawn, he had twice liberty to re-enter the council-chamber, to make for himself such representations and requests as he thought proper. It is said, that while he was under examination, he made use of our Saviour’s answer to the Jewish council, while he stood before them “If I tell you, ye will not believe me and if I also ask you, ye will not answer me, nor let me go.” After three quarters of an hour’s stay at the Cockpit, he was sent to the Tower, privately, in his own coach, without any noise or observation. This commitment of a bishop upon the suspicion of hightreason, as it was a thing rarely practised since the Reformation, occasioned various speculations among the people. March 23, 1723, a bill was brought into the House of Commons, for “inflicting certain pains and penalties on Francis lord bishop of Rochester” a copy of which was sent to him, with notice that he had liberty of counsel and solicitors for making his defence. 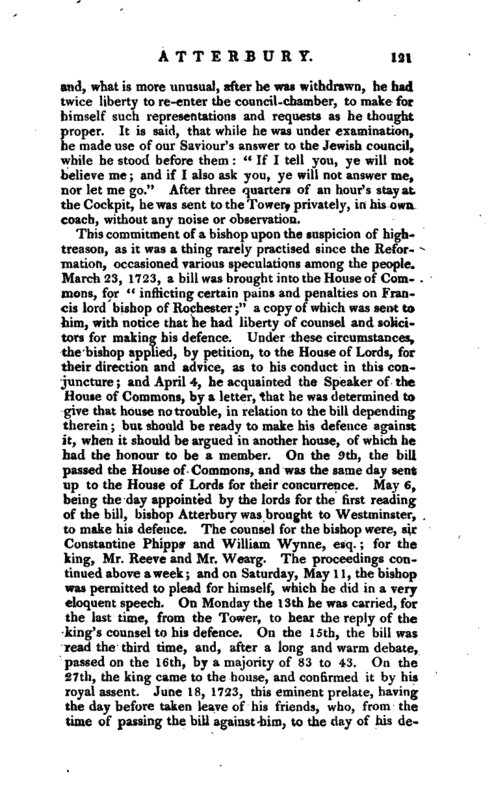 Under these circumstances, the bishop applied, by petition, to the House of Lords, for their direction and advice, as to his conduct in this conjuncture and April 4, he acquainted the Speaker of the House of Commons, by a letter, that he was determined to give that house no trouble, in relation to the bill depending therein but should be ready to make his defence against it, when it should be argued in another house, of which he had the honour to be a member. On the 9th, the bill passed the House of Commons, and was the same day sent up to the House of Lords for their concurrence. May 6, being the day appointed by the lords for the first reading of the bill, bishop Atterbury was brought to Westminster, to make his defence. The counsel for the bishop were, sir Constantine Phipps and William Wynne, esq. for the king, Mr. Reeve and Mr. Wearg. The proceedings continued above a week; and on Saturday, May 11, the bishop was permitted to plead for himself, which he did in a very eloquent speech. On Monday the 13th he was carried, for the last time, from the Tower, to hear the reply of the king’s counsel to his defence. On the 15th, the bill was read the third time, and, after a long and warm detiate, passed on the 16th, by a majority of 83 to 43. On the 27th, the king came to the house, and confirmed it by his royal assent. June 18, 1723, this eminent prelate, having the day before taken leave of his friends, who, from the time of passing the bill against him, to the day of his | departure, had free access to him in the Tower, embarked on board the Aldborough man of war, and landed the Friday following at Calais. When he went on shore, having been informed that lord Bolingbroke, who had, after the rising of the parliament, received the king’s pardon, was arrived at the same place on his return to England, he said, with an air of pleasantry, “Then I am exchanged” and it was, in the opinion of Mr. Pope on the same occasion, “a sign of the nation’s being afraid of being over-run with too much politeness, when it could not regain one great man, but at the expence of another.” But the severity of his treatment did not cease even with his banishment. The same vindictive spirit pursued him in foreign climes. 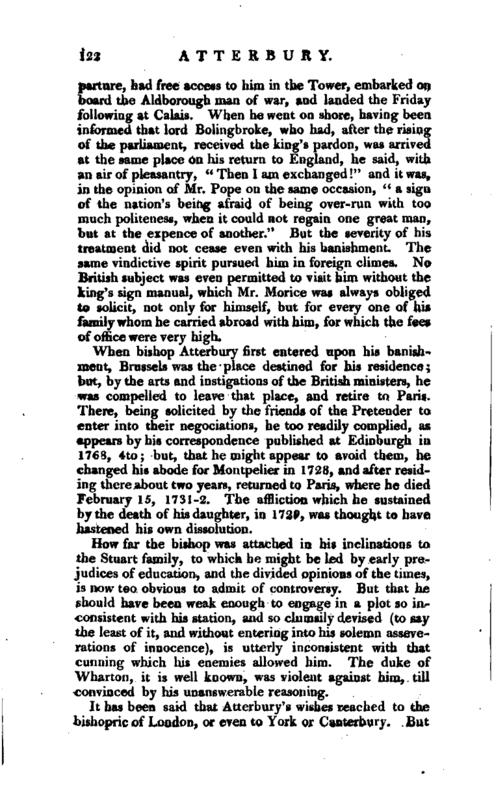 NoBritish subject was even permitted to visit him without the king’s sign manual, which Mr. Morice was always obligee! to solicit, not only for himself, but for every one of his family whom he carried abroad with him, for which the fees of office were very high. When bishop Atterbury first entered upon his banishment, Brussels was the place destined for his residence 5 but, by the arts and instigations of the British ministers, he was compelled to leave that place, and retire to Paris. There, being solicited by the friends of the Pretender to enter into their negociations, he too readily complied, as appears by his correspondence published at Edinburgh in 1768, 4to; but, that he might appear to avoid them, he changed his abode for Montpelier in 1728, and after residing there about two years, returned to Paris, where he died February 15, 1731-2. The affliction which he sustained by the death of his daughter, in 1729, was thought to have hastened his own dissolution. How far the bishop was attached in his inclinations to the Stuart family, to which he might be led by early prejudices of education, and the divided opinions of the times, is now too obvious to admit of controversy. But that he should have been weak enough to engage in a plot so inconsistent with his station, and so clumsily devised (to say the least of it, and without entering into his solemn asseverations of innocence), is utterly inconsistent with that cunning which his enemies allowed him. The duke of Wharton, it is well known, was violent against him, till convinced by his unanswerable reasoning. It has been said that Atterbury’s wishes reached to the bishopric of London, or even to York or Canterbury. But | those who were better acquainted with his views, knew that Winchester would have been much more desirable to him than either of the others. And it has been asserted, from respectable authority, that that bishopric was offered to him whenever it should become vacant (and till that event should happen, a pension of 5000l. a-year, besides an ample provision for Mr. Morice) if he would cease to give the opposition he did to sir Robert Wai pole’s administration, by his speeches and protests in the House of Lords. When that offer was rejected by the bishop, then the contrivance for his ruin was determined on but surely no contrivance could have been successful, had he been innocent of the treason laid to his charge. Some time before his death, he published a Vindication of himself, bishop Smalridge, and Dr. Aldrich, from a charge brought against them by Mr. Oldmixon, of having | altered and interpolated the copy of lord Clarendons “History of the Rebellion.” Bishop Atterbury’s Sermons are extant in four volumes in 8vo those contained in the two first were published by himself, and dedicated to his great patron sir Jonathan Trelawny, bishop of Winchester those in the two last were published after his death, by Dr. Thomas Moore, his lordship’s chaplain. Four admirable Visitation charges accompany his Epistolary Correspondence, which was completed in 1798, by Mr. Nichols, in 5 vols. 8vo containing also all his tracts, and a vast mass of curious and interesting ecclesiastical history. To the last volume is prefixed a life, written with great care and accuracy, and correcting the many mistakes of preceding biographers. It is needless to add how much the present article stands indebted to Mr. Nichols’s labours. As to bishop Atterbury’s character, however the moral and political part of it may have been differently represented by the opposite parties, it is universally agreed, that he was a man of great learning and uncommon abilities, a fine writer, and a most excellent preacher. His learned friend Smalridge, in the speech he made, when he presented him to the upper house of convocation, as prolocutor, styles him “Vir in nullo literarum genere hospes, in plerisque artibus et studiis diu et feliciter exercitatus, in maxime perfectis literarum disciplinis perfectissimus.” In his controversial writings, he was sometimes too severe upon his adversary, and dealt rather too much in satire and invective but this his panegyrist imputes more to the natural fervour of his wit, than to any bitterness of temper, or prepense malice. In his sermons, however, he is not only every way unexceptionable, but highly to be commended. The truth is, his talent as a preacher was so excellent and remarkable, that it may not improperly he said, that he owed his preferment to the pulpit, nor any hard matter to trace him, through his writings, to his several promotions in the church. 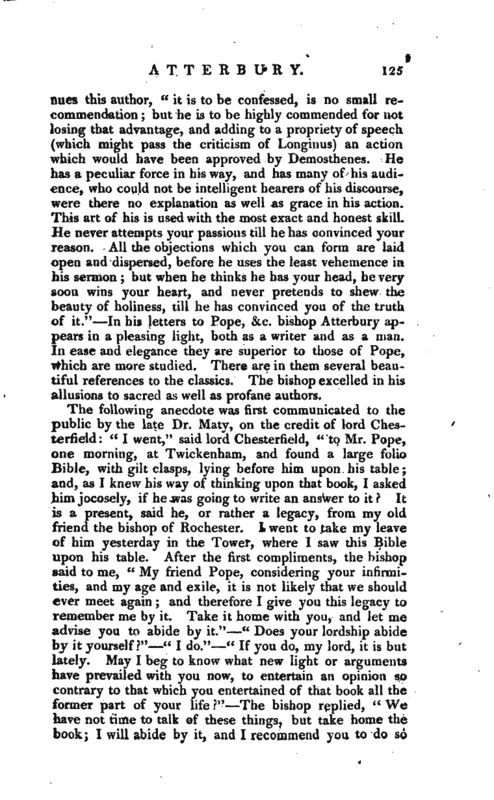 We shall conclude bishop Atterbury’s character, as a preacher, with the encomium bestowed on him by the author of “The Tatler” who, having observed that the English clergy too much neglect the art of speaking, makes a particular exception with regard to our prelate; who, says he, “has so particular a regard to his congregation, that he commits to his memory what he has to say to them, and has so soft and graceful a behaviour, that it must attract your attention. 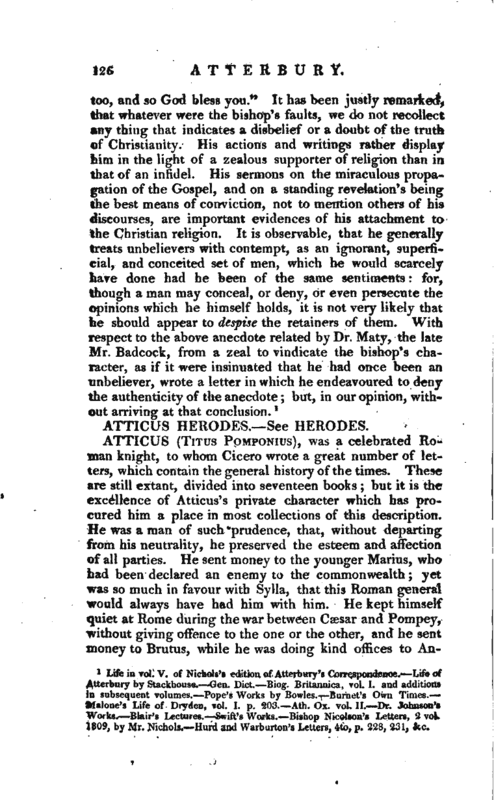 His person,” | contnues this author, “it is to be confessed, is no small recommendation but he is to be highly commended for not losing that advantage, and adding to a propriety of speech (which might pass the criticism of Longinus) an action which would have been approved by Demosthenes. He has a peculiar force in his way, and has many of his audience, who could not be intelligent hearers of his discourse, were there no explanation as well as grace in his action. This art of his is used with the most exact and honest skill. He never attempts your passions till he has convinced your: reason. All the objections which you can form are laid open and dispersed, before he uses the least vehemence in his sermon; but when he thinks he has your head, he very soon wins your heart, and never pretends to shew the beauty of holiness, till he has convinced you of the truth of it.” In his letters to Pope, &c. bishop Atterbury appears in a pleasing light, both as a writer and as a man. In ease and elegance they are superior to those of Pope, which are more studied. There are in them several beautiful references to the classics. The bishop excelled in his allusions to sacred as well as profane authors. Life in vol. 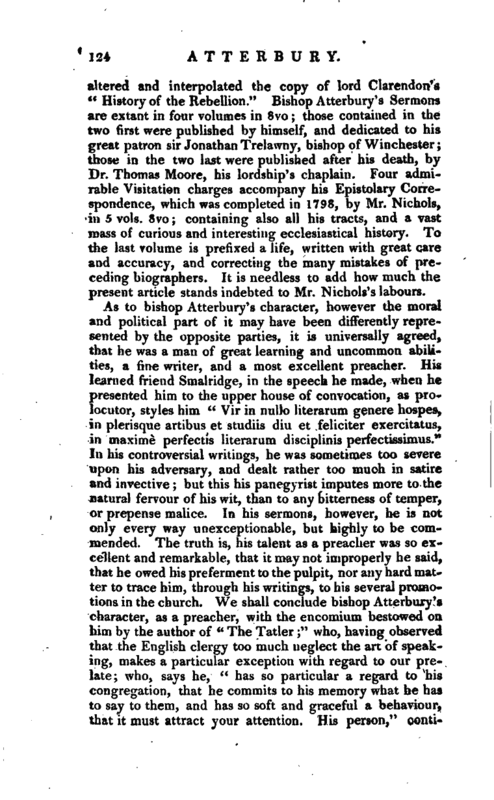 V. of Nichols’s edition of Atterbury’s Correspondence.' Life of Atterbury by Stackbouse. Gen. Dict. Biog. Britannica, vol. I. and additions in subsequent volumes. Pope’s Works by Bowles. 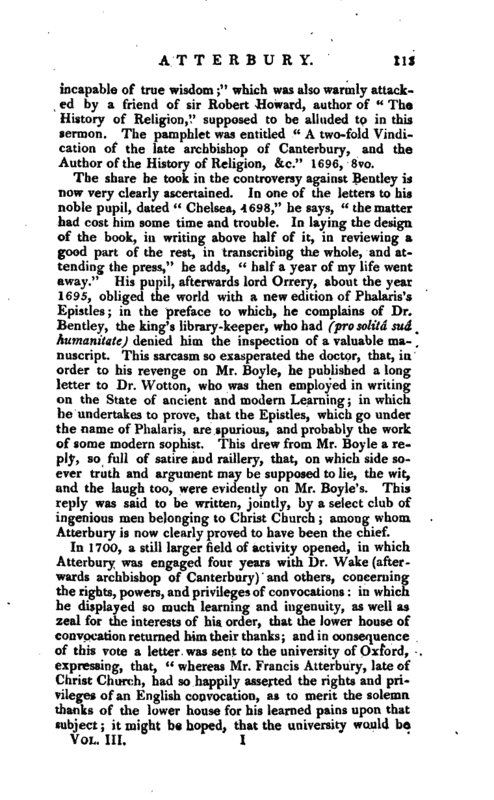 Burnet’s Own Times.­Malone’s Life of Dryden, vol. I. p. 203. —Ath. Ox. vol. II. Dr. Johnson’s Works. Blair’s Lectures. Swift’s Works. Bishop Nicolson’s Letters, 2 vol. 1809, by Mr. Nichols. Hurd and Warburton’s Letters, 4to, p. 223, 231," &c.